If you prefer the luxury, superior service, quiet tranquillity, privacy, and limited number of guests that one finds at a boutique hotel, a typical hotel or self-catering guest house is definitely not your ideal accommodation solution. Instead, lodge accommodation should suit you perfectly, particularly when you are visiting a game- or nature reserve in southern Africa. It is best to choose one that has received five superb stars, like Fifty Seven Waterberg, which is situated in the private Welgevonden Game Reserve in the Limpopo Province of South Africa. Star grading, once awarded, does not carry a “forever” guarantee. Periodically, graded establishments are re-inspected and re-assessed to ensure that standards, accommodation, and facilities have not deteriorated in any way. Failure to comply with the Tourism Grading Council of South Africa’s applicable lodge rating criteria would result in an instant downgrading, even at a game lodge that is surrounded by bushveld, such as Welgevonden’s untamed terrain. Today’s five stars could quickly become tomorrow’s four or three, if standards are not maintained meticulously or even improved upon. In addition to our five stars at Welgevonden’s Fifty Seven Waterberg, we also boast numerous tourism awards – for excellence, outstanding service, guest reviews, and for our luxurious and exclusive private accommodation. In modern times, luxury, privacy, and exclusivity go hand in hand. Unlike the era in which mass-produced goods and services were invented and became popular, discerning people prefer things that are unique and exclusive. Although exclusivity is aspirational and sought-after by many, it is only intended for a smaller, select market. This principle applies to lodge accommodation, facilities, amenities, and services too. Welgevonden is a private game reserve, located in the lush Waterberg region of the Limpopo Province. It is a paradise for wildlife, including the famous Big 5 species: African elephant, Cape buffalo, African leopard, African lion, and rhino. They are accommodated in the 35 000 ha reserve. The African elephant is the largest land mammal in the entire world. Herds are led by a matriarch, which is usually the oldest, most experienced female in the herd. Cape buffalo are considered by many as the most dangerous member of the Big 5 group. Buffalo are intelligent and can become exceptionally aggressive. African leopards are notoriously difficult to spot in their preferred habitat: trees. These solitary creatures are not easy to find, but our ranger knows how, where, and when to find them, so your chances of seeing this elusive big cat are comparatively good. As an Apex predator, the African male lion actually relies on his pride, as females to do most of the hunting. Welgevonden is also known for its healthy population of white rhino. Welgevonden’s guests are accommodated in a few lodges within the reserve, of which Fifty Seven Waterberg is one. We accommodate our visitors in five spacious, private luxurious suites. Each one is set discreetly apart from its neighbours to ensure that guests’ bushveld experience in Welgevonden is exclusive. At Fifty Seven Waterberg, we offer beautifully prepared dishes that are prepared by our resident master of cuisine, Chef Gabriel, and his assistant, Lukas. 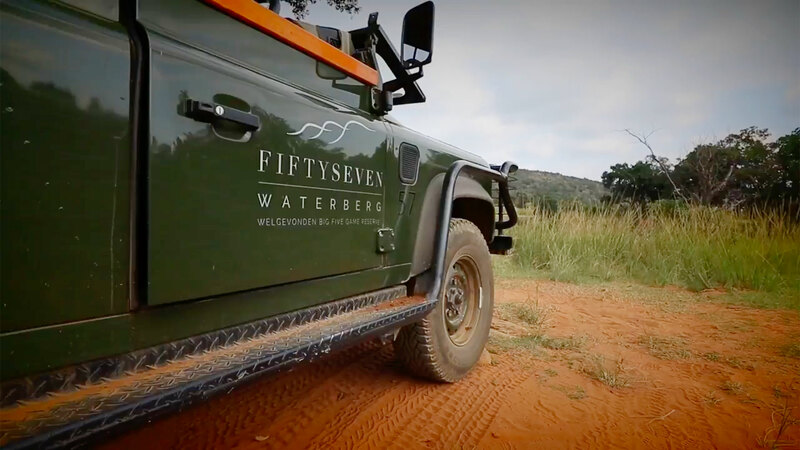 All your needs and more are efficiently taken care of at Fifty Seven Waterberg, leaving you free to enjoy the wonders of our lodge and Welgevonden.